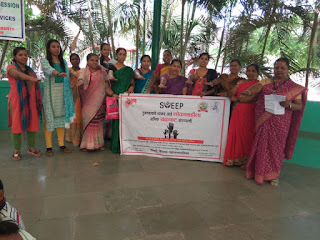 Chinchwad (Pune), 5-April-2019: The Don Bosco Development Society (DBDS), Chinchwad organized a health awareness session for the Self-Help Group women residing in Kalbhor Nagar. More than 50 women participated in the session held under the aegis of ‘Health Risk Reduction Project’ supported AXA Business Services. Ms. Lalita Chaudhari (Staff-DBDS) introduced the resource person and shared information about the project with the participants. 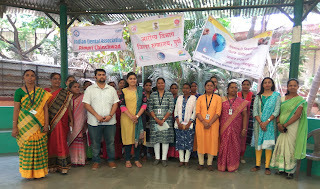 Dr. Roy, Dr. Pravin, Mrs. Sulakshana Kurne, Mrs. Sonali and Ms.Anita Waghchoure were the resource person for this session. Dr. Roy spoke about healthy nutrition, habits, composition of tobacco, forms of tobacco, harmful effects on body and mind, oral cancer, lung cancer and many more health problems associated with such habit. Ms. Anita spoke regarding harmful effects of tobacco and causes of Cancer. 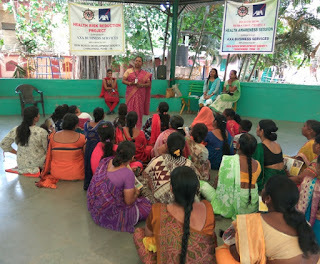 Mrs. Kurne gave information on the schemes of Municipal Corporation for women, children and SHGs group. 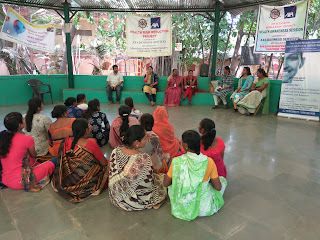 DBDS staff did the logistical arrangement for this session and organized women to participate in this session. After the session snacks were served to everyone.